Research in Information Systems helps supervisors and their students get the most out of the PhD experience. It can be used as a basis of courses for supervisors and their research students. Many vignettes of personal experiences and reflections provide context for the material. 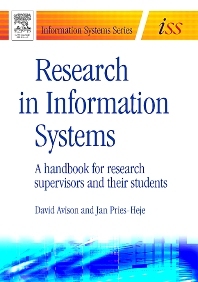 The book is written by experts – leading international academics in the field of information systems. They all have had wide experience of research supervision over many years in many countries. Preface; Acknowledgements; Part I Reflections: Chapter 1 - Advising and supervising, Chapter 2 - Confessions and reflections; Part II The supervisor/student relationship: Chapter 3 - Metaphors for PhD study, Chapter 4 - Focus on the supervisor, Chapter 5 - Focus on the student; Part III Social and practical issues: Chapter 6 - Serving two masters, Chapter 7 - Finance, Chapter 8 - Ethical issues, Chapter 9 - Gender issues, Chapter 10 Sexual orientation, Chapter 11 - Diverse cultures; Part IV Academic issues: Chapter 12 - Discipline of information systems, Chapter 13 - Quality and originality, Chapter 14 - Quantitative research, Chapter 15 - Qualitative research; Part V PhD models: Chapter 16 - US model, Chapter 17 - UK Model, Chapter 18 - Latin model, Chapter 19 - Scandinavian model; Bibliography; Author biographies; Index. David Avison is Professor of Information Systems at ESSEC Business School, Paris, France after being Professor at the School of Management at Southampton University for nine years. He is also visiting professor at University Technology, Sydney, Australia and Brunel University in England. So far, he has published over twenty books as well as a large number of papers in learned journals, edited texts and conference papers. He is Chair of the International Federation of Information Processing (IFIP) 8.2 group on the impact of IS/IT on organisations and society and was past President of the UK Academy for Information Systems and also UK Professors and Heads of IS. He will be joint programme chair of the International Conference in Information Systems in Las Vegas in 2005 and has been chair of several other international conferences. He also acts as consultant and has most recently worked with a leading manufacturer developing their IT/IS strategy. He researches on information systems in their natural setting, in particular using action research. Jan Pries-Heje is Associate Professor at The IT University of Copenhagen, Denmark. Since 2002 he has also been part-time full professor in software engineering and management at the IT University of Gothenburg, Sweden. Jan Pries-Heje holds M.Sc. and Ph.D. degrees from Copenhagen Business School, Denmark. He is certified ISO 9000 auditor and BOOTSTRAP assessor, and has been project manager for a number of Multi Media and IT-related change projects. He worked as a Consultant 1997-2000 in IT quality and software process improvement. He is Chairman of the Information Systems Research in Scandinavia (IRIS) Steering Committee. He is the Danish National Representative to IFIP Technical Committee 8 (TC8) on Information Systems, and Secretary for TC8 since 1999. His research interests include information systems development, software engineering, and software process improvement. He focus on organisational and managerial issues. He has published more than 100 papers in these areas in journals and conferences.